Intermediate. A great way to study bebop! This outstanding set includes transcribed solos written and played by Jimmy on the guitar. Used for play along purposes, the special demo track has Jimmy soloing with the rhythm section and playing all 10 solos from the book. A NEW CONCEPT in transcribed solos; you actually see and hear what is played on the demo track. 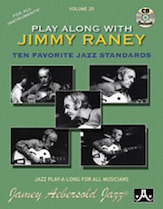 Chord progressions are based on standards and Jimmy has written solos over them. All parts, solos and chord changes,are transposed for ALL instruments, so everyone can play along with Jimmy's legendary comping.